This 8 x 8 Blakeney Summerhouse was installed in our customer's landscaped garden in Guildford, Surrey. 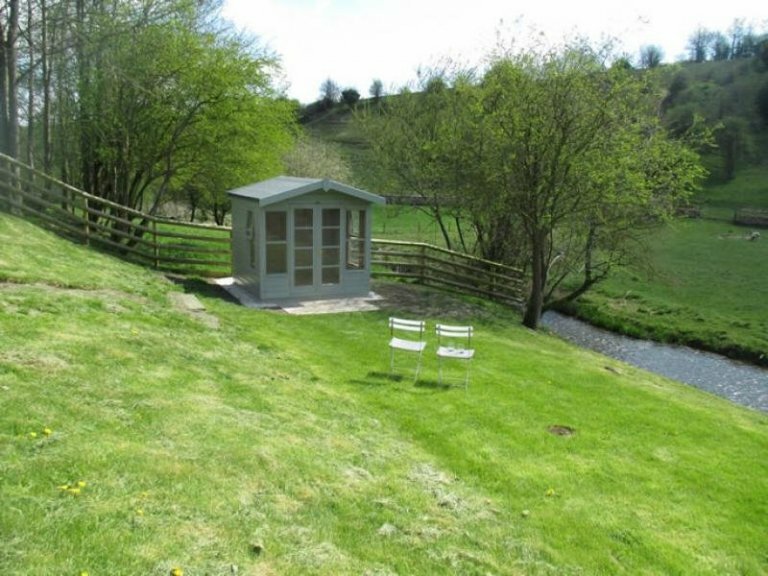 Located close to a stream, this enables our customer to enjoy watching the abundant wildlife and birdlife which visits. The exterior was created using our planed shiplap cladding and painted in Lizard from our Valtti Colour Collection, an extremely durable paint option which minimises redecoration. The apex roof is lined with our Heavy Duty Roofing Felt. It features two opening windows along with the fully glazed double doors, which allows in plenty of natural daylight. The interior floor was insulated and finished in our natural lacquer, which provides a warm and inviting interior. 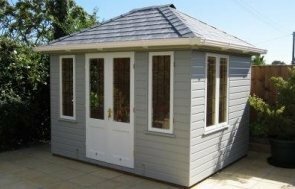 We create a wide variety of Summerhouses here at Crane Garden Buildings; The Wiveton, The Cley, The Holkham, The Morston, The Weybourne and the National Trust Collection. We encourage customers to pay us a visit at one of our Seven UK Show Centres, the locations can be found at the bottom of this page. You can browse an array of display buildings in the flesh, getting a feel for the luxury of our offering. 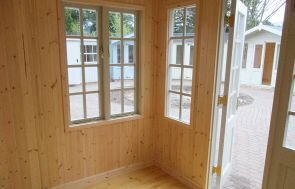 If you would like to know more about our Summerhouses, you can click the link below.